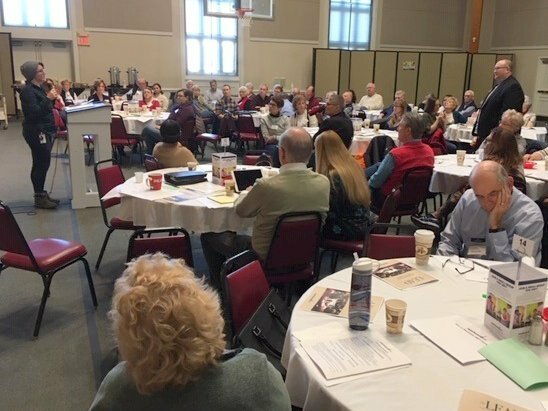 On Saturday, Feb. 9, approximately 100 staff and lay leaders of ministries gathered for leadership development here at Manchester UMC. There are several purposes for this annual event. One is practical: learning procedures for room scheduling, publicizing events, etc. Another is to update leaders about progress toward the vision plan/priorities established for our church. (You can refresh your memory about the plan here.) Third is to have fellowship, celebrate how God’s moving in our midst, and worship. A lot of work goes into making the event possible. We’re grateful for the United Methodist Men for providing a wonderful breakfast. Our staff and the Leadership Board invest their time and energies, and Pastor Jim Peich oversees many of the arrangements. A special word of thanks goes to our District Superintendent, Rev. Londia Granger Wright, for her time with us; she updated folks on the appointive process for pastors and answered questions. We have a wonderful team of leaders, with a heart for Christ and his mission, here at Manchester UMC. Thanks to each for their outstanding work! I sent an email Sunday night regarding the tragedy of a visitor taking his own life in a restroom at our church. Please continue to pray for his family and all affected by this. In the days ahead, we will do whatever we can to be in ministry to them. Thank you. Join us on an exciting 6-week faith journey as we gather in small groups to explore Henri Nouwen’s book, “Here and Now: Living in the Spirit,” during the upcoming season of Lent. This short, easy-to-read book is packed with powerful and practical guidance for all ages and stages. So, come along on this church-wide small group experience as we grow in faith together and also connect with more people! We’ll begin our journey in March and finish before Easter. We’re offering daytime and evening small group options on nearly every day of the week. Complimentary childcare is also available. Browse available groups now and sign-up. You can keep up with the latest happenings at this Conference by clicking on this link. You can also get daily updates from the Conference by subscribing to the Missouri Annual Conference email list. The sessions will be livestreamed; you can access it here. For a video explaining the General Conference voting process, click here. Speaking of the GC, we all want the Holy Spirit to shape the outcome. Accordingly, I thought it would be helpful to put things in a Biblical perspective. I’ve chosen Acts 10:44-48 for the text.